Date: Apr 28 2019, 8 p.m. - 10 p.m. 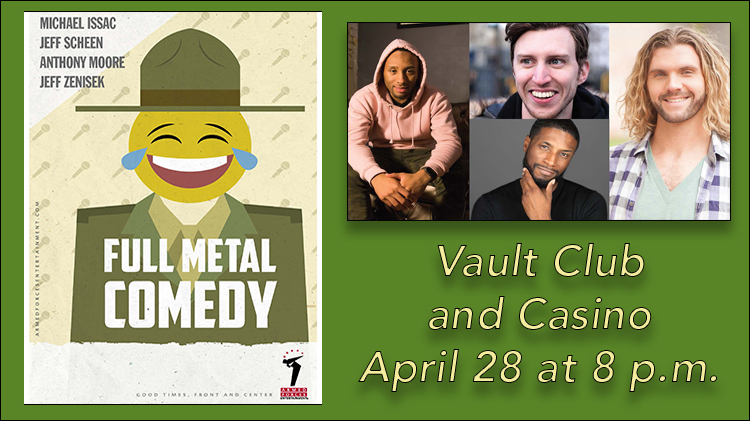 The Vault Club and Casino hosts the Full Metal Comedy Show, courtesy of Armed Forces Entertainment, featuring comedians Michael Issac, Jeff Scheen, Anthony Moore and Jeff Zenisek. Anthony Moore is a comedian and writer hailing from west Philadelphia. Growing up within a tight-knit family in the Overbrook section of Philadelphia, Anthony's childhood and background has been the foundation of his laid-back, witty, original and thought-provoking comedy. In November Anthony makes his national television debut on Kevin Hart’s new show, Hart of the City on Comedy Central. Jeff Scheen is a stand-up comic hailing from Chicago, IL. Jeff has been featured on the FOX TV series Laughs and was a finalist in the 2016 Laughing Skull Festival in Atlanta, GA. He’s also been in a number of other comedy festivals including The Bridgetown Comedy Festival, Montreux’s Jokenation Festival, Laugh Your Asheville Off in North Carolina, and Laughfest in Grand Rapids Michigan. Jeff Zenisek is an up and coming stand-up comic who has has made appearances at the 10th Annual Laugh Your Asheville Off Festival, the 3rd Annual Burbank Comedy Festival and the 5th Annual Accidental Comedy Festival (Cleveland, OH). He also appeared in the Kansas City Comedy Festival, and also at the Scruffy City Comedy Festival (Knoxville, TN), and the 20th Annual LA Comedy Festival. Michael Issac, a Chicago native, has an anecdotal style of stand up comedy. He keeps audiences laughing with his relaxed delivery of funny stories about his unique life experiences. His comedy is full of anecdotes about growing up on the Southside as a child and moving to the South Suburbs as an adult. Recently, however, he has been performing on Cruises all over the Caribbean and South America. So let’s just say Issac has a “few” new jokes.